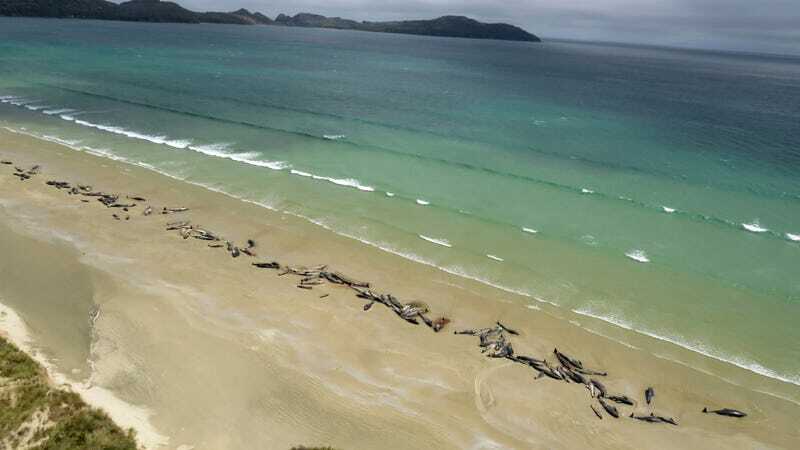 On Saturday, a hiker on a remote island in New Zealand discovered two pods worth of pilot whales had washed up on the beach. Though around 75 whales were dead when the hiker got to them, conservation workers decided to euthanize the remaining 145 on Sunday. According to the BBC, it’s not uncommon for whales to get stranded on local beaches in the spring and summer, but it is uncommon for entires pod to wash up on one, though it happens. In this case, the pods were beached about 1.2 miles from each other, on Stewart Island, which is located about 19 miles of New Zealand’s South Island. DOC Rakiura operations manager Ren Leppens said at least half of the whales were dead by the time staff arrived at the scene. Scientists have attributed that phenomenon to climate change, and though the stranded whales in New Zealand might be unrelated, experts say whale strandings could be the result of “sickness, navigational error, geographical features, a rapidly falling tide, being chased by a predator, or extreme weather,” all of which are also potential consequences of a changing climate. Basically, we and our marine life are screwed.